The fourth entry in the Game of Thrones series, “Sons of Winter”, provides a terrific jolt of energy to the proceedings after the third episode’s flagging pace and lack of depth. 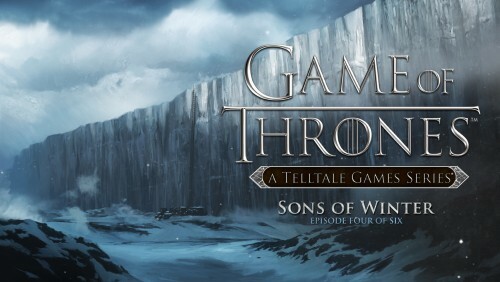 That episode, which we didn’t review largely because of a lack of time, felt quite flat and left us concerned that the writers of Telltales’ adventure game had run out of steam after the first two episodes proved solid and interesting. This concern proves unfounded with this episode, which includes several excellent set-pieces which advance the story, each in their own way. Of the four focal areas of the narrative, Ironrath and King’s Landing are the most enjoyable as the narrative plays with the byzantine machinations that take place in the “game of thrones”. The Wall doesn’t feature a great deal of narrative interest this time around, although it does feature one of the fun set-pieces as Gared and his companions get into a spot of trouble (more below, in the spoiler section). Similarly, Meereen also features a terrific action set-piece (even better than the one at the Wall), and it’s also a bit stronger on a narrative level as we explore more of Beshka’s background and discover why she’s been so hesitant to return to Meereen. Fleshing out the game’s secondary characters helps create a richer, more believable story in which multiple parties are acting (sometimes with one another, more often against another) in realistic and comprehensible ways. And there are more examples than Meereen: Ironrath and King’s Landing both also feature this deepening of our understanding of characters, while doing so in a fashion that is exciting for a player. For those who wonder, this episode is perhaps the first where there’s not some strange question of setting continuity or missed details. And in fact, it was great fun to realize part way through that the achievments for this episode were all drawn from various house words that GRRM provided for our Heraldry project. That was a pleasant surprise! The action sequence in Meereen was certainly engaging, and the way that a couple of choices seemed to have some immediate significance to how things played out, but for our money it was the wedding feast in King’s Landing that seemed the most fascinating set-piece as Mira tries to ferret out just who is Lord Whitehill’s ally, and in the process finds a way to attack that person’s ability to do the bidding of the Whitehills. There’s no great action here, simply a simple “game” of eavesdropping—I never dared listen through the entirety of dialog, assuming that if you did it too long you’d get caught—and then putting the pieces together. While Lord Tarwick’s insistence that the story of Lyman Lannister wasn’t fit for a maid was a bit odd (Westeros wouldn’t really have any familarity with the concept of drug addiction, outside of alcohol, and we don’t see much compunction against speaking about someone being a drunk), it’s a nice use of a thematic detail in the setting—the addictive nature of milk of the poppy—and makes it a part of the plot as Mira uses it to break Lyman’s association with Lord Andros. The whole of the Ironrath story may be the particular standout of this episode, however. Rodrik’s determination to win Ironrath free of the Whitehills and to restore Ryon to his family provdes a strong center for the story, and the character is fleshed out a bit more as he interacts (awkwardly, when we made our first run through the game) with Elaena. While the elite guard of the Glenmores feels a little odd, and is probably the biggest thematic stretch of the episode, taking down Gryff was certainly a satisfying moment. Better yet, the set-piece at Highpoint was particularly noteworthy in the tension it created and sustained as matters began to go increasingly pear-shaped. We’re very curious how some of the alternative choices might have played out, but our own choice—to call his bluff—built on the seeds of details they laid out shortly before. It works nicely, and again, you could cut the tension with a knife. Fine work by the Telltale Games team. One thing we’ve not remarked before, or at least I think we haven’t, is the voice acting, which is uniformly quite good and a far cry from the stilted voiceovers that I was used to in most videogames back in the ‘90s. You can find the game on Steam, as well as a wide array of other platforms.